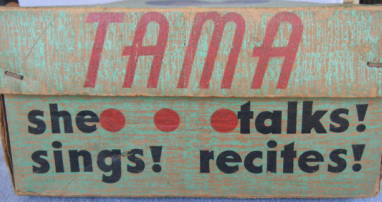 Tama was purchased on eBay and came with original clothing as well as her box and a very frail set of instructions. Tamas are quite rare, this is the first one we have seen come up on eBay after several years of watching. Patent: US2695472 (This is the patent for the Advance Doll and Toy Company's Winnie doll which has a similar but not identical clockwork sound system. It is not clear whether another patent was filed for Tama. 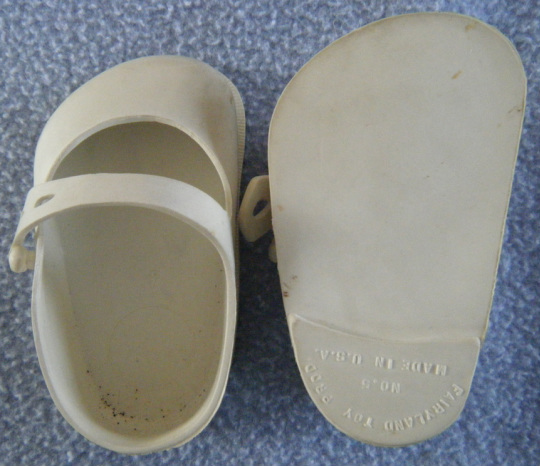 The patent was issued to Anthony G. Ardolino, a brother of Edward - Tama's designer). "Phonograph Dolls and Toys" by Joan and Robin Rolfs (published by Mulholland Press, Inc. in 2004) has the most complete information on Tama dolls that I have come across. The following information is a brief summary of key points from the book. Production of Tama started in 1954. 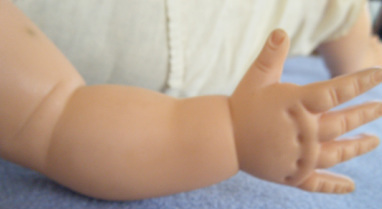 The doll was named after the daughter of one of the designers, Edward Ardolino, for the Advance Doll and Toy Company. 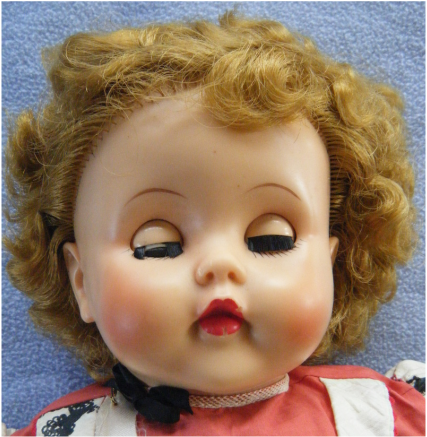 The 3" records were intended to be interchangeable allowing the doll to talk, sing, and pray. Edie Adams provided the voice for Tama. After we cleaned and repaired the sound system (damaged record not withstanding), we got the doll to tell us her name, recite 1...2 Buckle My Shoe and several other phrases. I should have written them down but didn't think of it at the time. This was how Tama looked when she arrived. She is about 23" tall. Tama's hair is rooted and appears to be in its original styling - no barbering by young stylists. Tama has clear blue eyes. The eyebrows and lower eyelashes are painted. The upper eyelashes are real. One eye is missing the middle section of eyelashes. We did find a few loose lashes in her hair. Both of Tama's arms were covered with black smudges on the back side. The smudges looked like ink from newsprint. We aren't sure, but it is possible the doll was nested in newspaper at some point in its past history. 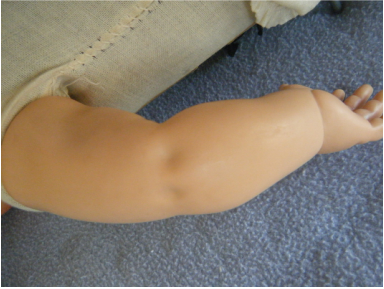 There is a little bit of a concavity in the arm as well. It is not clear if this was a weakness in the design or if it is an aging issue. Tama has a bad case of box hair - when comes from being stored flat on her back for years. 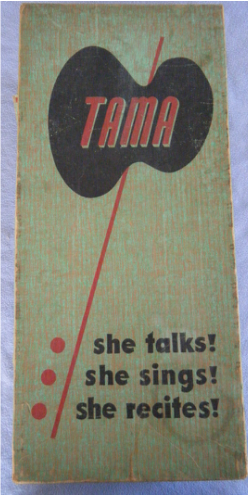 One of the reasons we were interested in acquiring a Tama, is because of her wind up phonograph system. 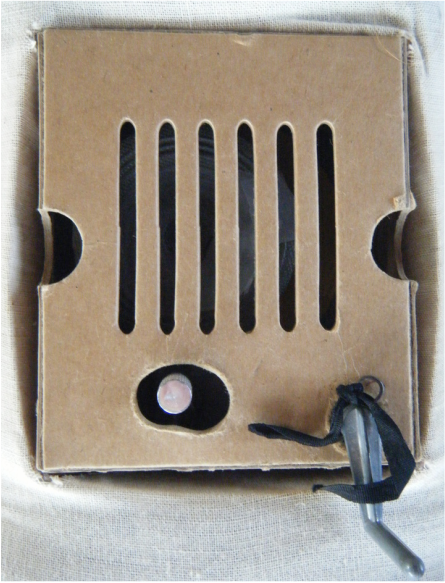 Removing her clothing, reveals her stuffed cloth body and the distinctive cardboard phonograph housing with speaker grille. 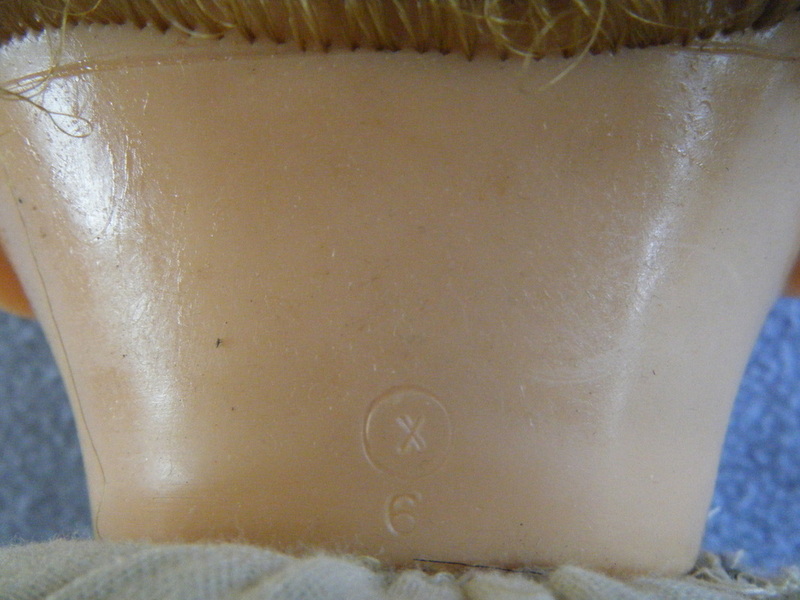 The one seam that is coming apart is the seam around the neck. You can see her stuffing peeking out. 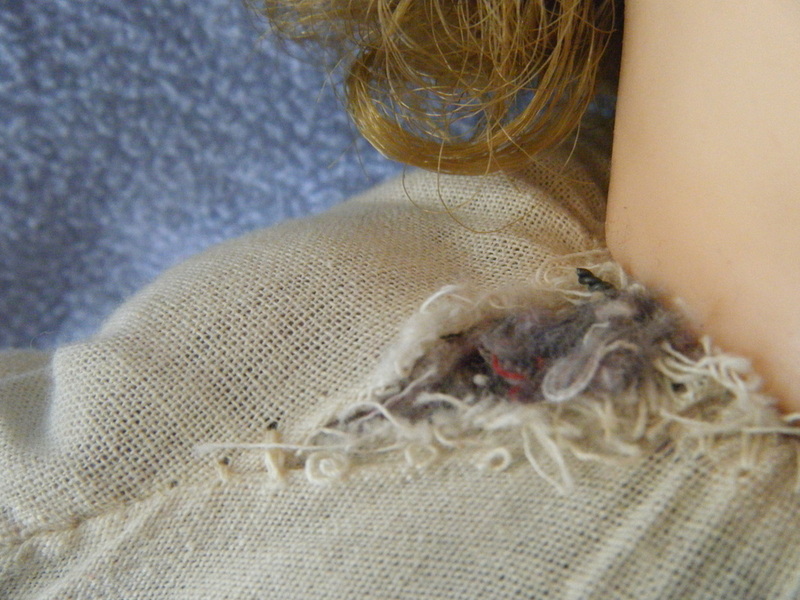 The stitching is rather large in this area, so we believe this is where the doll was closed up. Gently prodding around the hole, we found that the wire loop used to secure the cloth body to the vinyl head was twisted together in this spot. It's sharp ends point upward and ripped out the seam. Tama was a little dusty and her vinyl head and limbs were smudged and dirty. One thing that we noticed upon closer inspection is that Tama's lips have missing pieces. There are similar nicks in her nose. We have no idea what could have caused this damage. Here is a better view of the area missing lashes. Notice the black particulate on the eyelid and around the eye. This is likely from disintegrating eyelashes. 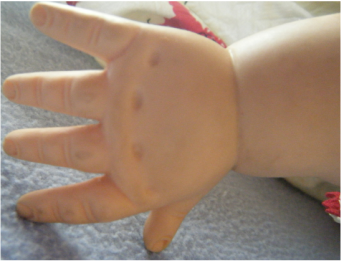 Tama's hands have accumulated dust in the creases, dimples, and in the fingernail cuticles. 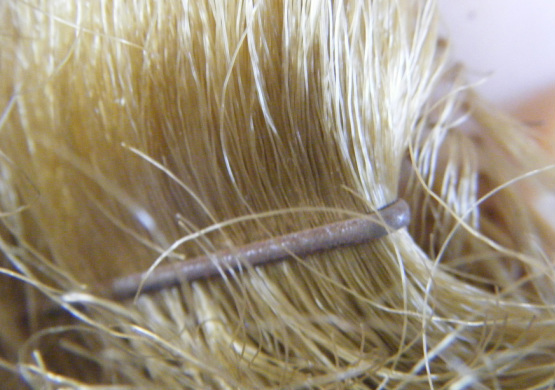 While inspecting Tama's hair, we discovered two rather rusty hair pins (one near each ear). We suspect that they are original to the doll. Rather than leave them rusting in the hair - we took them out and set them aside. Tama's body is stuffed quite firmly. The seams around her bottom and legs are in excellent shape. There is no staining. We always check necks to see what manufacturer's marks are present. The only marks we found are a circle X and a "6". 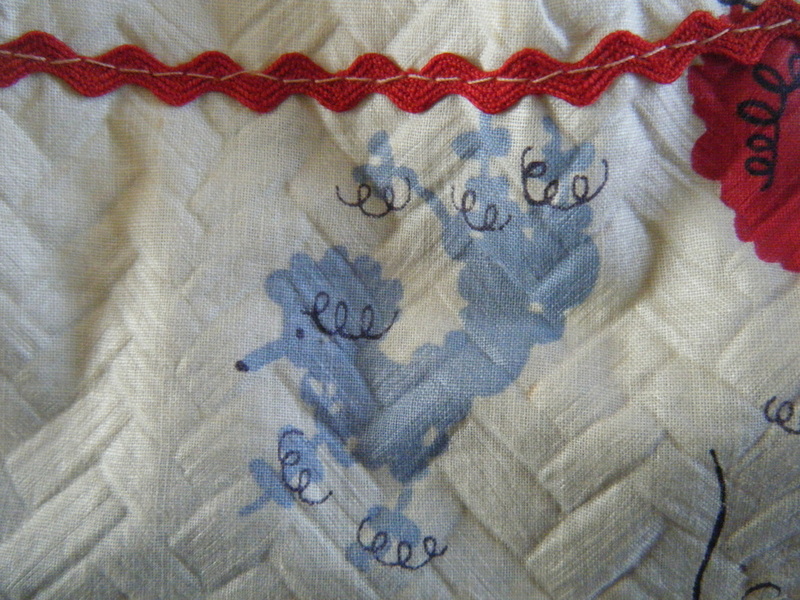 Circle X marks are often associated with Molleye dolls. Perhaps there was a connection between the two companies or Advance just used a similar mark. 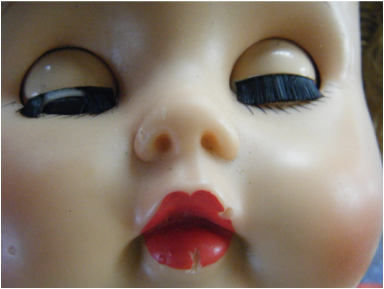 The neck of the doll was quite "sticky". Tama's dress is original. It features various color poodles playing with balls of string. There is a little black bow at the neck. This photo shows the details around the neck. 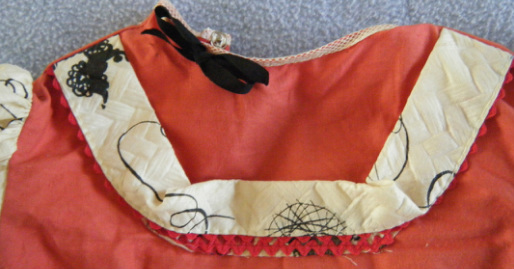 The neck has almost a mesh-like edging and a black bow. There is red rick-rack along the lower edge of the poodle print. 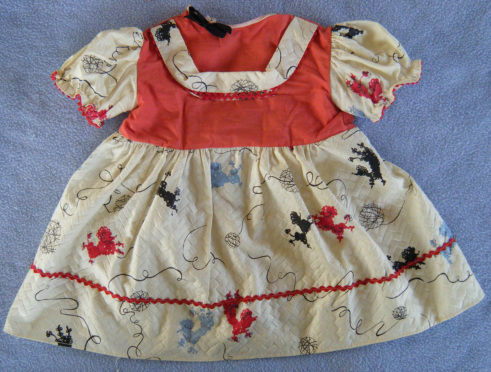 Here a good view of one of the printed poodles as well as the basket weave material used on the skirt portion of the dress. The doll has her original underwear as well. 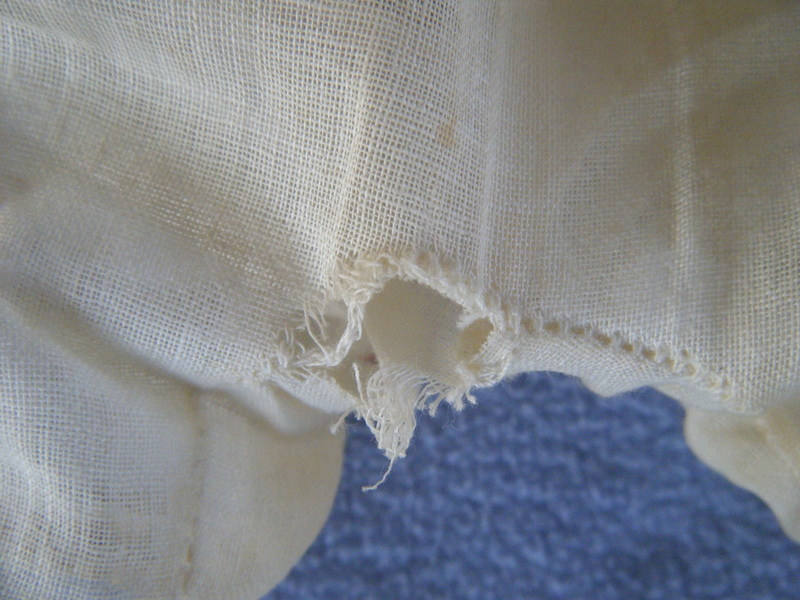 Like almost all underwear of this time period, the elastic has failed. There is some discoloration around the leg holes. 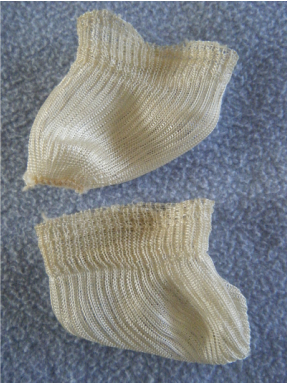 Tama has her original socks as well. They are in great shape except for some possible yellowing. One of the shoes has a dark stain on it. Tama still has her sash. It came safety pinned to the top and bottom of the dress. 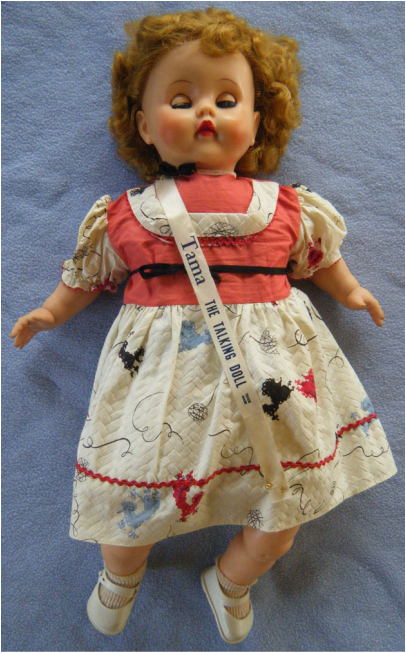 At first we thought that a previous owner had pinned it back on the doll but based on the oxidized discoloration around a single set of pin holes we believe the sash had not been removed since leaving the factory. The dress has three snaps in the back. 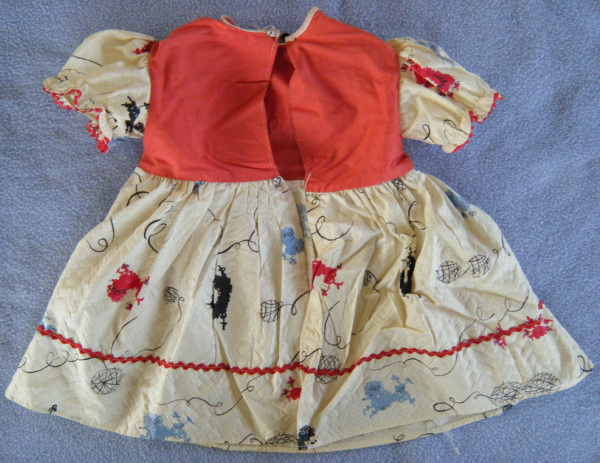 The dress was cinched around the middle with a black bow. 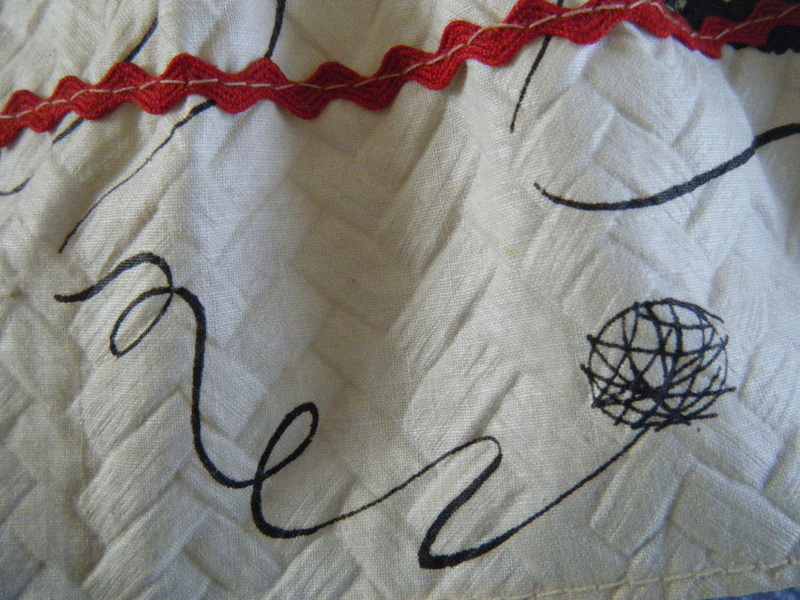 A close-up of the middle snap in the back of the dress. This is a ball of string on the print. Even though the dress is dusty and could use a little unwrinkling, my sister doesn't want to expose it to water for fear that the red rick rack will bleed. 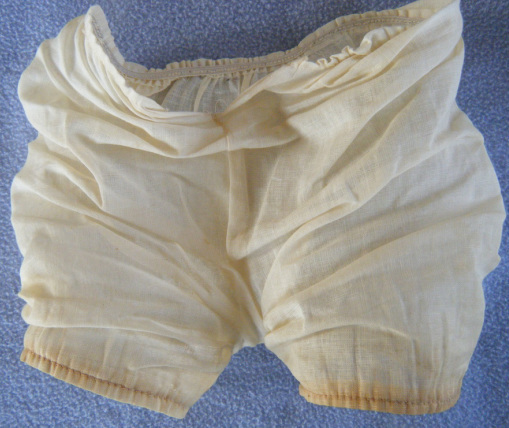 The underwear has an open seam at the crotch. Remarkably, Tama has her original shoes as well. The straps and rubber stud are not broken. 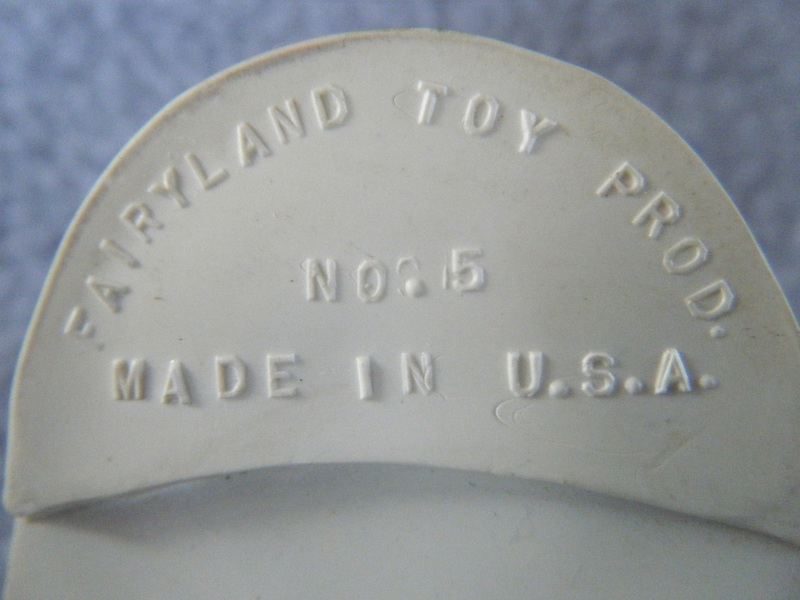 The heels of the shoes say, "Fairyland Toy Prod., No. 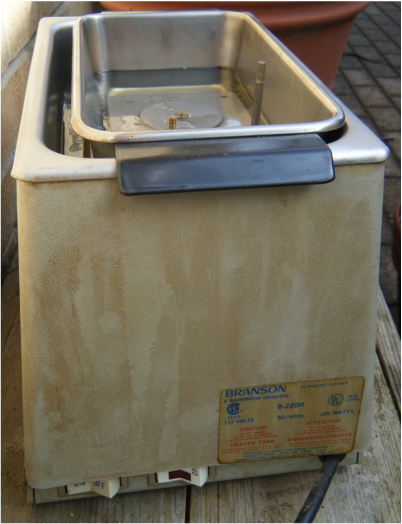 5, Made in U.S.A."
While I investigated the clockwork speaking mechanism, my sister undertook vinyl cleaning and hair styling operations. 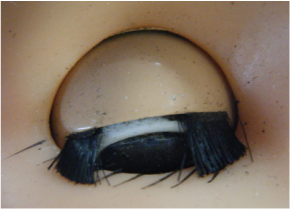 Here is what Tama's face looks like once the grime is removed from the face, ears, nose, and mouth and the black eyelash residue is cleaned from around the eyes. 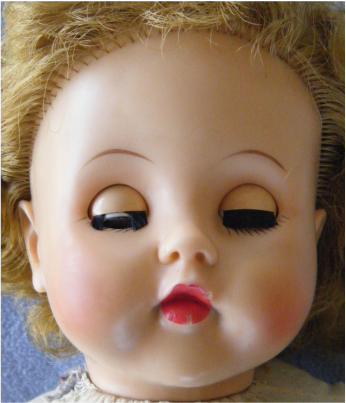 Doll cleaner did a great job of gently removing years worth of dust. Special swabs were used to clean dimples and creases. The darkish spot on the upper arm has diffused into the vinyl. It is a good candidate for treatment with Remove-zit. The legs also cleaned up very nicely. Although the hair is dusty, my sister decided that shampooing would be too risky. 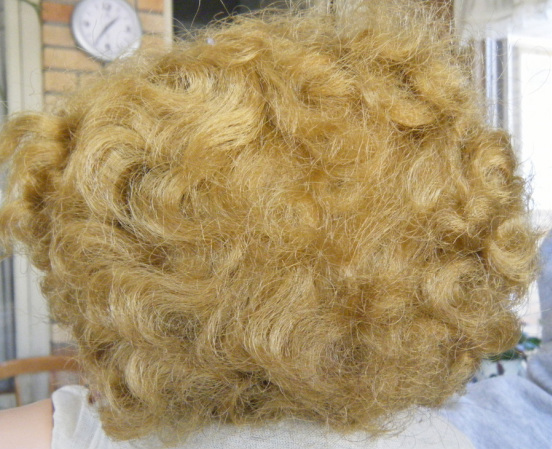 The hair is fairly brittle and could start breaking and the original hairdo would be very hard to recreate. 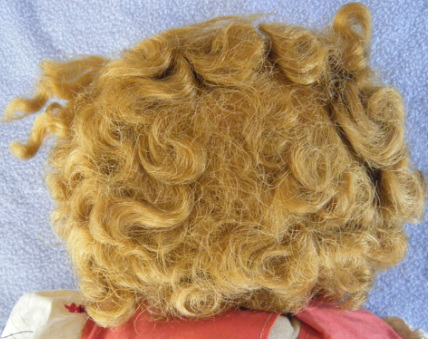 Instead, she used her doll brushes and fluffed up the hair where it had become flattened from the doll being in storage. 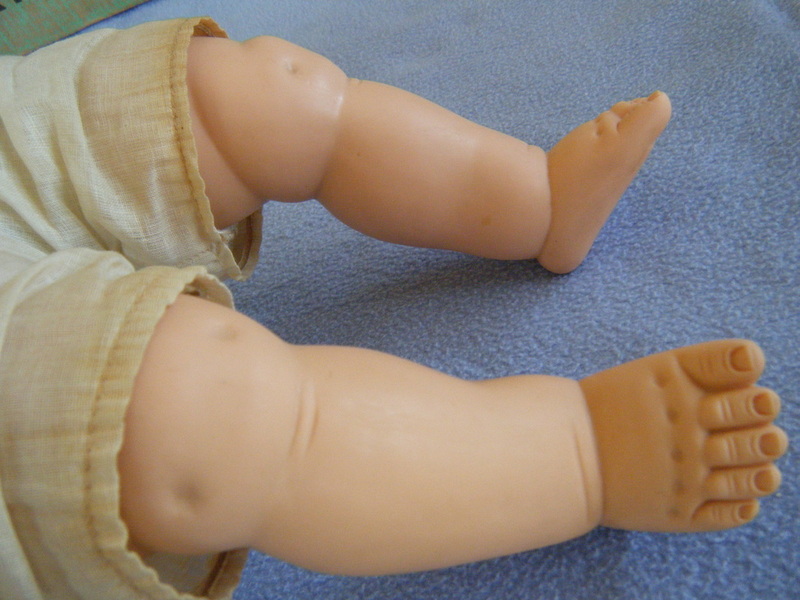 The doll cleaner removed the black smudges from the backs of the arms. 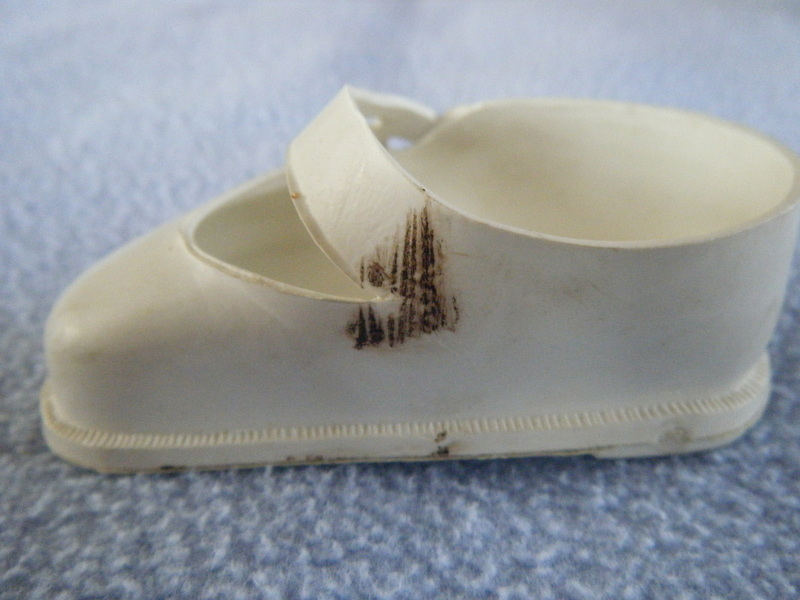 Doll cleaner eliminated most of the brown staining on the shoe. The remaining discoloration is another candidate for treatment with Remove-zit. 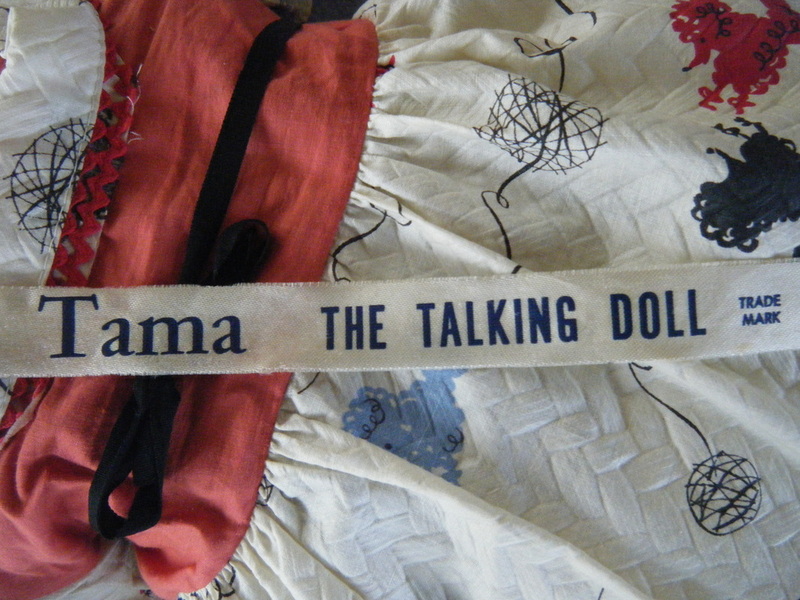 My part of the project was to document the doll and to address any issues with the phonograph system. 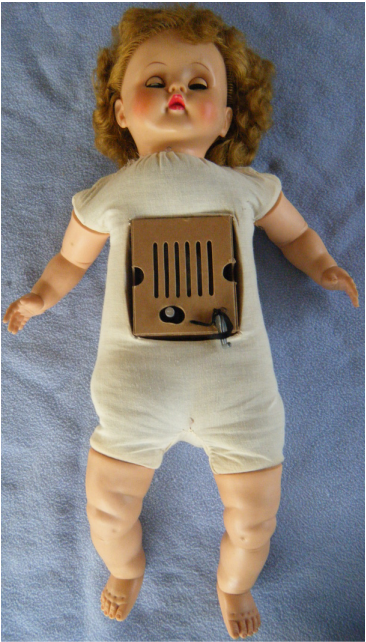 Once the doll was undressed, I examined the sound box. Two metal pieces protrude from the box. The one on the left in the photo is a knurled knob (in the kidney shaped hole) used to move the stylus back from the center of the record to the edge. 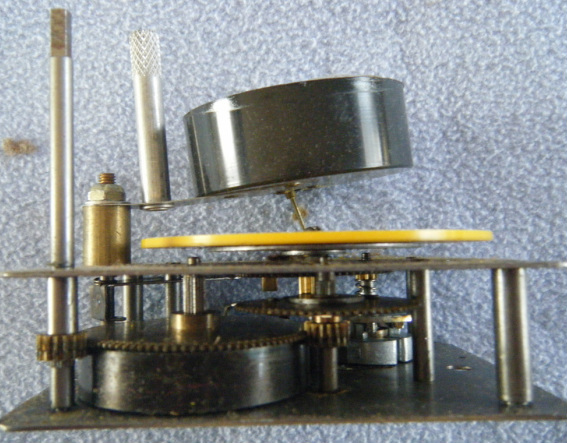 The crank on the right is used to wind up the clockworks that drive the turntable. The vertical slits let out the sound. 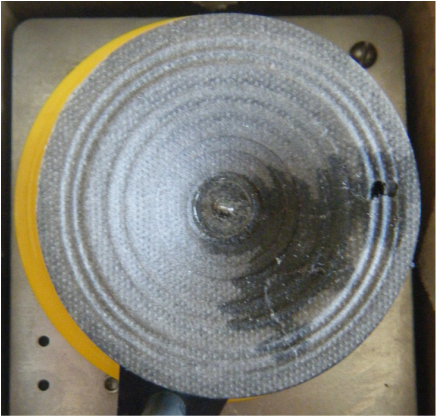 The half circles at either side are finger cut outs for removing the cover, servicing the unit, and changing out records. When I peered through the slits I could see tape on the speaker cone. The unit had been repaired at some point. At first, I thought the clip was intended to keep the winding crank from getting separated from the doll. When I took the crank off, I could see that the clip does not interact with the winding shaft at all. The point of the clip seems to be to keep the cardboard cover from working its way out of the doll and popping out the crank. This is the crank that came with the doll as it matches the crank illustrated in the instructions. To get a better handle on the status of the phonograph unit, I removed the two screws holding it in place and pulled it out. 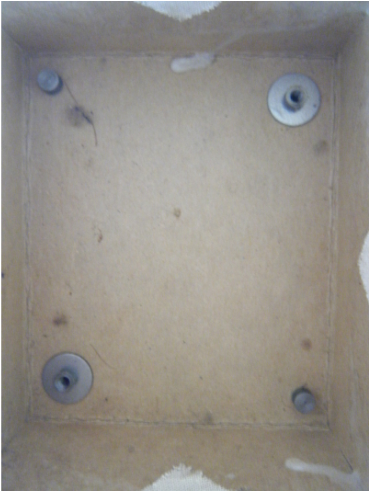 Looking into the box reveals two "T" nuts and two spacing studs. 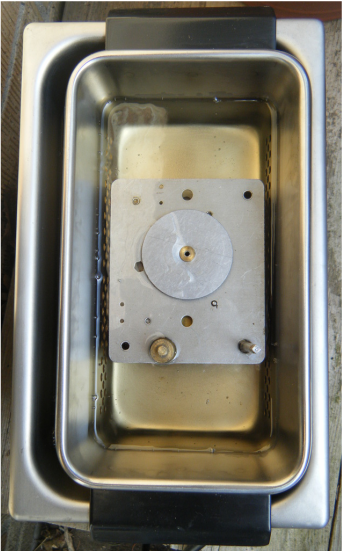 This arrangement means that the box could be installed with the crank closer to the feet or 180 degrees around with the crank closer to the head. The photo in the Phonograph Dolls and Toys book shows the mechanism installed crank up. 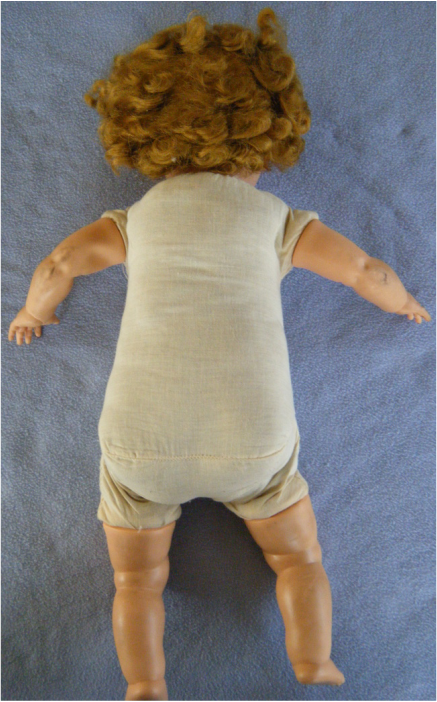 I believe that doll had the system re-installed wrong way round for the following reason. Winding the doll requires reaching a hand up under the doll's dress. This would be much easier to accomplish under the loose skirted area and almost impossible under the tighter (and belted off) bodice area. The instructions also describe the sound system in this orientation. As a side note, the doll in the book photo probably has a replacement key - it looks like a standard, two-eared clock key and not a crank. Also visible inside the box are a whitish glob of glue, some fragments of doll hair, and lint. The darker stains are from the oil that was used to lubricate the gear pivots in the clockworks. These are most probably from the original installation as it is unlikely the mechanism would have been lubricated by an owner. 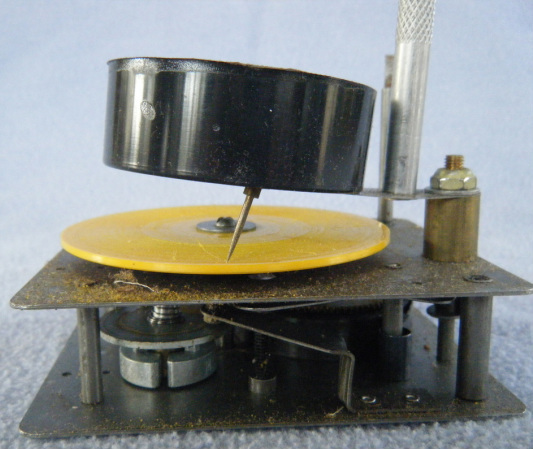 This is a good overview of the clockworks needed to move the turntable at a constant speed. The cylinder looking object the lower left is actually the uncoiled main spring. You can't see it in the photo but the gears show some wear and have hardened lubricant on them. 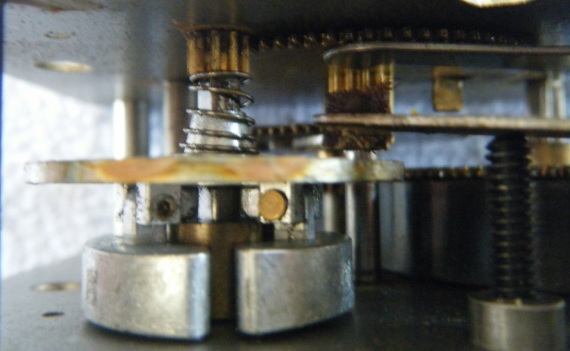 Tiny brass particles stuck to the mechanism indicate some gears have been grinding. Several strands of doll hair were wrapped around the gear that spins the turntable. I used compressed air to blow out a lot of the lint and debris but the mechanism was so dirty that more serious cleaning was warranted. Here is a view of the turntable with the record removed. The crank has a clip on it. The clip has a strip of black fabric on it (like the bow on the collar and the waist tie). 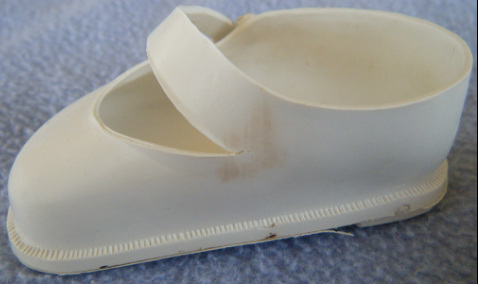 The fabric makes removing the clip easier. I removed the cardboard cover and had a look inside. 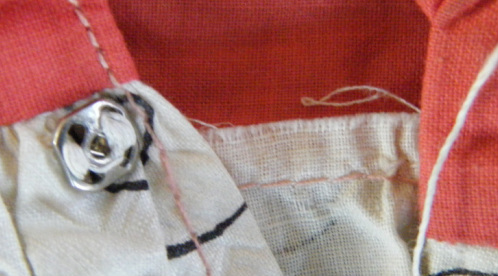 The white triangles around the edge of the photo are where an "X" was cut in the fabric forming the doll's stomach. 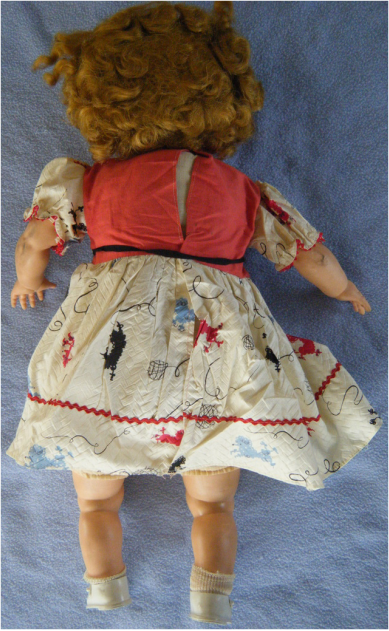 The fabric flaps were then glued to the insides of a cardboard box inserted into the doll. The tape on the speaker is now clearly visible. I could also see that the record and phonograph unit were quite dusty and little tuffs of lint were free to roll about. 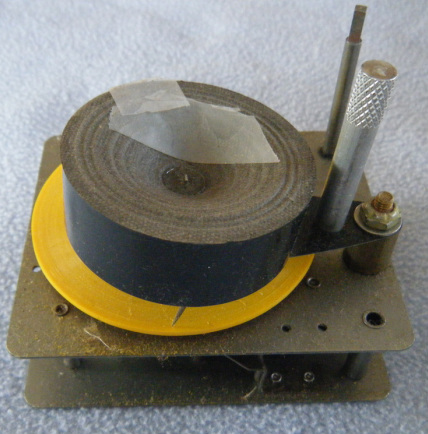 Here is what the phonograph unit looks like removed from the doll. Notice the square ended winding shaft in the upper right. The knurled shaft is used to lift and swing the stylus speaker combo from the center of the record back to the outer edge. The stylus is the needle like object in the bottom center touching the yellow record. Notice all the fuzz and grit on the metal plates. 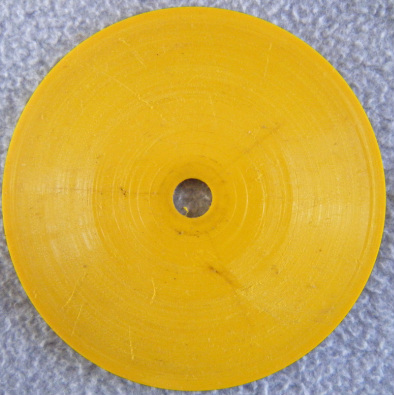 The yellow particles are from the needle gouging grooves in the record. More on that farther on in the gallery. 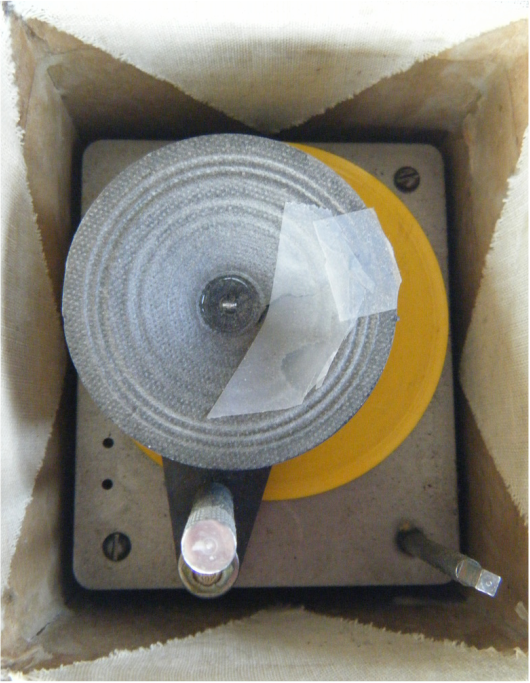 One of the things that bothered me when I was inspecting the phonograph unit were the taped rips in the speaker cone. I couldn't imagine why they would be there - the owner would not open the sound system unless they were considering replacing the record with one of the other records that were sold separately. Here is my hypothesis. 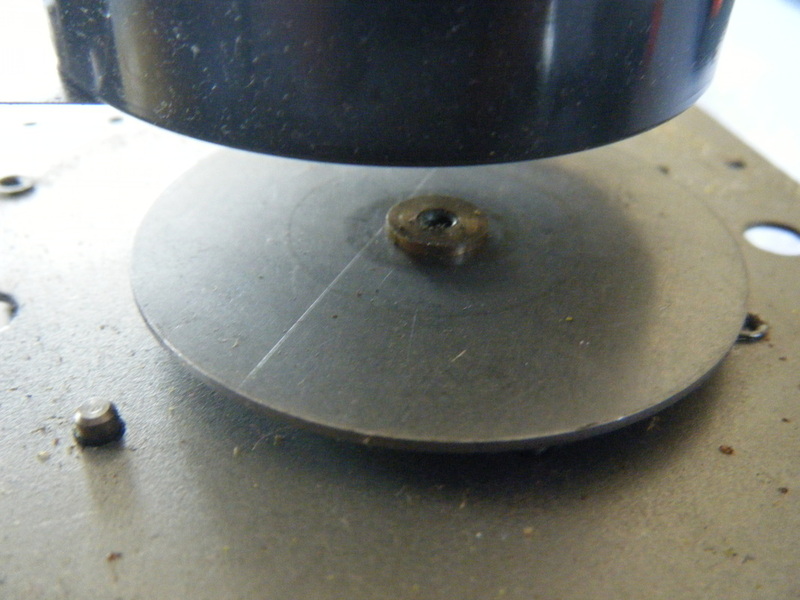 To change the record requires taking out the screw in the center of the record. 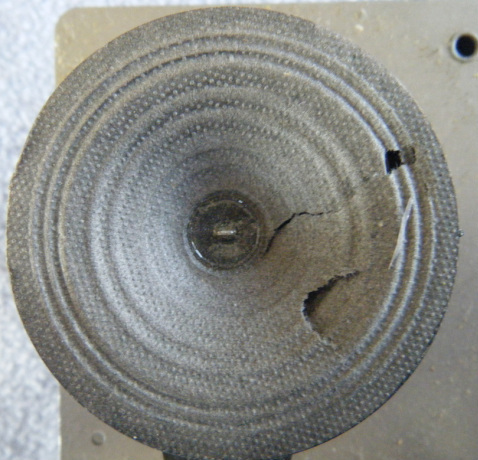 This screw is virtually inaccessible because it is hidden beneath the speaker cone that does not swing far enough out of the way to expose the screw. While using a screwdriver in one hand, the other hand was wrestling with the speaker and trying to keep the turn table from spinning at the same time. A thumb slipped or gripped the paper cone and tore it. The only way I could take the record out for cleaning was to use an offset screwdriver - and even that was a tricky operation. This view of the clockworks emphasizes the governor used to keep the turntable spinning at a constant rate. A constant rate is necessary to keep the doll's voice sounding the same throughout the spring's going from tightly wound to relaxed. Otherwise she would start speaking really fast and progress to speaking really slowly. Anyway, the governor is composed of three little swing arm weights that are like airplane amusement park rides. It is hard to see in the photo, but the governor is kept from floating up too high by a leather bumper in a plate that is adjusted by the black bolt in the lower right. 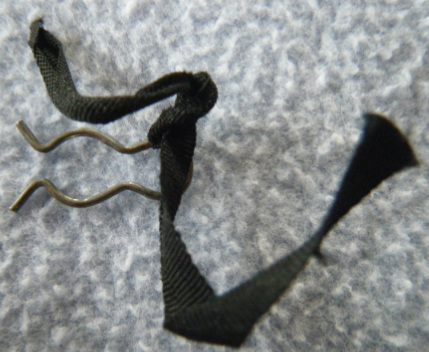 There is also a conical coil spring that keeps the governor from rising and falling freely. This is the record once it was removed from the sound system. It is interesting to note that the record is yellow. Other Tama records I have seen in photos are black. A photo of Winnie records in the Phonograph Dolls and Toys book are yellow. The record is in bad shape - it is dirty and badly scratched. I played with the color and contrast settings on this photograph to give the reader some idea of the extent of the damage. Parts of the record are really roughened up from the stylus cutting its own grooves. 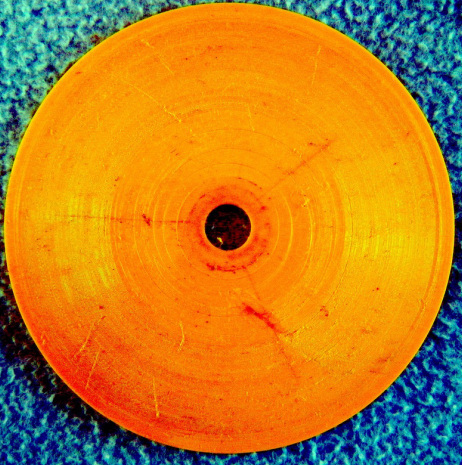 The thick orange mark in the lower right quadrant is actually part of a glob of glue that extended from the center of the record to about midway out. From the damage to the record, it would seem that the stylus would run into the glue and then deflect outward cutting its own grooves. 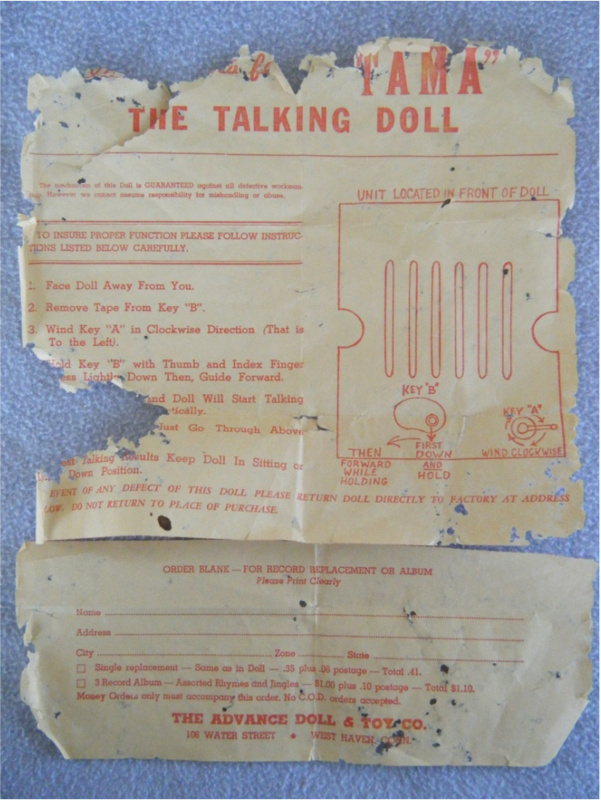 This is conjecture on my part, but I believe the glue is original and got slopped onto the record when the sound unit was assembled into the doll and the fabric flaps were glued down. When the doll was talking the needle would skip. 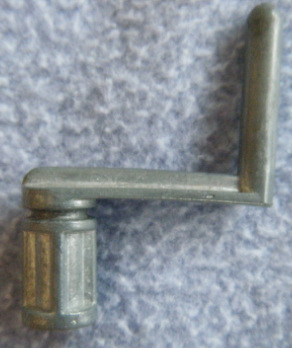 The owner would use the knurled knob to advance the track manually. The needle would hit the glue and skip again. Frustrated the owner went to change out the record and accidentally punched the hole in the speaker. I was able to flake the glue off the record but the damage was already done. Tama only speaks by manually advancing the needle past the damaged tracks. 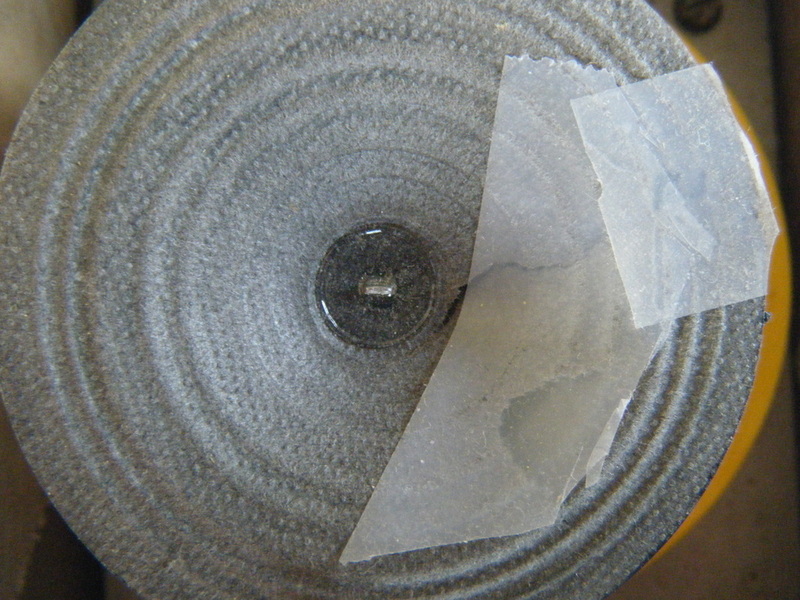 Here is the tape that a previous owner had used in an attempt to fix the speaker cone. The tape was very loose and I was able to gently peel it free. The tape probably just created a buzzing sound when the doll was speaking. The cone really needs to be replaced. I tried a little first aid by using a pin to lift the torn flaps into place and applying drops of Krazy glue along the seam. The glue probably stiffened the paper too much to be highly effective but the doll was able to speak so that we could understand her. Removing the tape reveals two tears and a hole in the paper. My father cleans and repairs old clocks and owns a sonic cleaner. Since Tama's mechanism was so dirty and dry, I decided to clean and oil it. The unit both vibrates and applies heat to the cleaning solutions. If I had disassembled the clockworks entirely, I would have put any small pieces in this strainer prior to immersion in the cleaner. 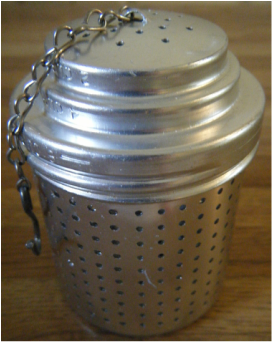 This prevents the pieces from getting lost when solutions are being poured. Getting the box with the doll was a big bonus. The box was not as big an advertisement as later boxes would become. The ends of the box are identical and don't seem well laid out from a readability perspective. Here is what remains of the original instruction sheet. They look like they experienced some insect damage. If only we could still purchase additional records for $1 plus postage.